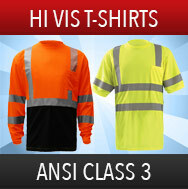 Now available are Class 2 Hi Vis T-Shirts and Class 3 High Visibility T-Shirts, in short or long sleeve styles. Choose from poly/cotton blend, moisture-wicking polyester and more. Safetysmartgear.com offers lightweight, heavyweight and birdseye mesh materials for year-round comfort while staying compliant. 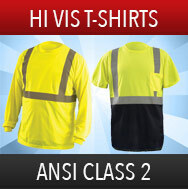 ANSI Class hi vis t-shirts provide the same high visibility standards as safety vests and in many cases offer more comfort and can be less cumbersome. Available in high visibility lime, yellow or orange and in sizes from small to 10X on some models. Great for warehouse workers, landscaping, construction crews and event safety. 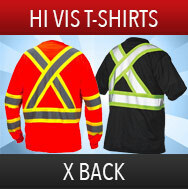 We offer custom printing on all of our hivis T Shirts. Safety T-Shirts of various styles are at big discounts and offered as top brand names such Occunomix, PIP, Pyramex, Majestic, GSS and Port & Company. 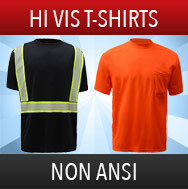 Question: Why can't I find a 100% cotton ANSI Class High Visibility T Shirt? Answer: Cotton can not hold the dyes required to maintain ANSI visibility standards. That's why Polyester or Poly/Cotton Blends are used. The newer moisture wicking polyester fabrics will actually feel more comfortable and keep you dryer than cotton, as well as keep you ANSI visibility compliant.